The San Francisco Bay Area is a region that is highly vulnerable to natural hazards like earthquakes, wildfires, and severe weather. Communities across the Bay Area are now bracing for potential downpours, flooding, mudslides and more as a result of the strong El Nino impact we are experiencing this winter. ABC7 has gathered resources and tips to make it easier for you to access preparedness information all in one place. A Safeway parking lot flooded in Healdsburg on Thursday, Dec. 11, 2014. Do you feel prepared for severe weather in the Bay Area? If not, here are 7 tips to help you get started. Experts believe that the Northern California area is one of the most seismically active areas of the state. The overall probability of a magnitude 6.7 or larger earthquake striking the Greater Bay Area in the next 30 years is 63 percent. Unfortunately, most residents are not prepared to protect their families, homes and finances. Preparing now will help you survive and recover and get back to normal after the next damaging earthquake. 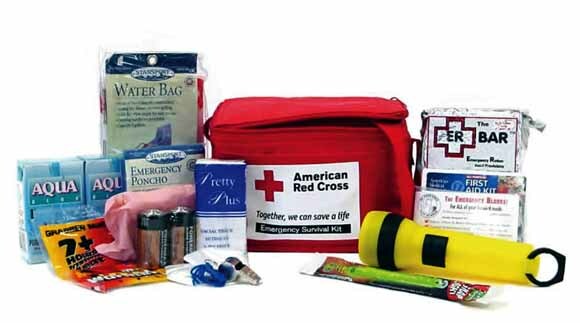 Keep basic supplies in an easy-to-carry emergency preparedness kit that you can use at home or take with you in case you must evacuate. Start building your kit with this detailed list of supplies and make sure you have the Red Cross Earthquake Safety Checklist. Identify out-of-area emergency contacts. Decide where to reunite with loved ones after a disaster in case phone lines are down. Write your plan on an emergency contact card and store in your phone along with important numbers for emergency resources in your area. Use the tips in this guide to start making your plan! Discuss how to prepare and safely respond to the emergencies most likely to happen where you live, work and play. Make sure know how the notification systems in your area work. Most residential insurance policies do not cover earthquake damage - a separate earthquake policy is required. Without earthquake insurance to help cover the costs of repairs and other expenses that come with catastrophic damage, you will pay out-of-pocket to fix your home, to replace your personal property, and to live and eat elsewhere. The California Earthquake Authority is a publicly managed, privately funded organization that provides catastrophe residential earthquake insurance and encourages Californians to reduce their risk of earthquake loss. If your home suffers catastrophic earthquake damage, the CEA can provide you with the strength to rebuild. With nearly $10 billion in claim-paying power, supported by the service expertise of its participating insurance companies, the CEA could cover all of its claims if the 1906 San Francisco, 1989 Loma Prieta, or 1994 Northridge earthquake reoccurred today. Excellent financial ratings. CEA's financial strength is rated A- (Excellent) by A.M. Best Company (a company that rates insurance companies). Expert service. CEA policies are available exclusively through CEA's participating insurance companies, which handle CEA-policy applications, renewals, billing, and claims. Rates based on science, not profit. By law, CEA rates must allow it to remain financially sound and to pay all its covered claims. CEA rates are based on the best available science for assessing earthquake risk and do not include any amount for profit. Not tied to government budgets. California's budget issues have no impact on the CEA's ability to pay its claims, because the CEA is a privately financed entity and receives no money through the state budget. Without earthquake insurance, the cost of any damage is your cost. If your CEA policy claim exceeds your deductible, you don't actually have to pay the deductible before claim-payment eligibility is triggered. Read more about CEA earthquake insurance policies and premiums and to see a list of insurance companies that sell CEA earthquake insurance. During an earthquake, know how to drop to the ground, take cover under sturdy furniture, and hold on to that furniture until after the shaking stops. Learn about Great ShakeOut Earthquake Drills, annual opportunities to practice what to do during an earthquake. Make sure your home is securely anchored to its foundation. Bolt and brace water heaters, gas appliances, bookcases, china cabinets and other tall furniture to wall studs. Hang heavy items such as pictures and mirrors, away from beds, couches, and anywhere people sleep or sit. Brace overhead light fixtures. Install strong latches or bolts on cabinets - store heavy items closest to floor. Be sure to take a look at the following websites, which are included to help you prepare now so you can survive and recover after the next damaging earthquake. Emergency preparedness means being prepared for whatever may happen. Find out about the threats and hazards in your area. Get peace of mind. Earthquake insurance is more affordable than you think. Contact a California Earthquake Authority agent for a quote or to arrange a visit. Learn what to do during an earthquake and join millions of people who will Drop, Cover, and Hold On during the Great California ShakeOut. Totally Unprepared is a web site featuring videos on how to get prepared, an earthquake safety checklist, entertaining games and information about earthquake preparedness. A helicopter flies through smoke from the Rocky Fire that's burning in Lake County, Calif. on Monday, August 3, 2015. On August 6, 2012, a fire burning at a refinery in Richmond prompted shelter-in-place orders for Richmond, North Richmond, and San Pablo. Make sure you know what shelter-in-place means! If your clothes catch on fire, STOP where you are, DROP to the ground and ROLL over and over to smother the flames. Remove all burned clothing. If clothing adheres to skin, cut or tear around burned area. Call 9-1-1 from a safe location. If you are trapped in a burning building, stay near a window and close to the floor. If possible, signal for help. 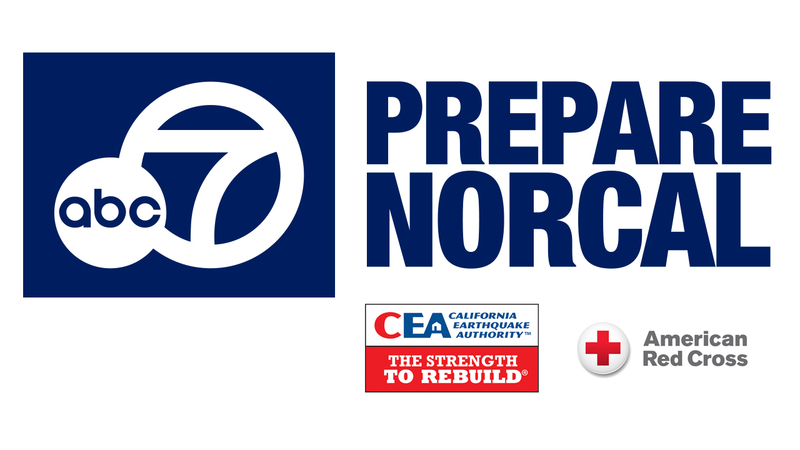 Home Depot and Kidde are proud partners with ABC7's Prepare NorCal initiative and our Operation 7: Save A Life program. Through a series of fire and carbon monoxide safety messages, Kidde and ABC7 work to increase public awareness about fire and carbon monoxide safety. In a major disaster, it might be several days before vital services are restored. Find out how you can prepare yourself and your family for an emergency. You can also learn what to do in response to a specific disaster. Empowering people in the San Francisco Bay Area to prevent, prepare for and respond to disasters and emergencies. Lists options to obtain training in first aid, CPR, AED, lifeguarding, swimming and babysitting in the San Francisco Bay Area. The Bay Area Earthquake Alliance coordinates earthquake awareness and preparedness activities throughout the San Francisco Bay Area. The Alliance is a part of the Earthquake Country Alliance (ECA), a statewide alliance linking organizations and individuals that provide earthquake information and services. Fritz Institute's BayPrep (formerly the Bay Area Preparedness Initiative) seeks to improve disaster preparedness in the San Francisco Bay Area and ensure that vulnerable communities have been taken into account in disaster planning. The CDC Emergency Preparedness and Response website is CDC's primary source of information and resources for preparing for and responding to public health emergencies. The CEA is committed to reducing injury, loss of life and property damage from earthquakes by motivating Californians to properly prepare themselves and their residences. Providing information and advice to protect life and property from natural hazards and to promote a better understanding of California's diverse geologic environment. Statewide "alliance of alliances" linking the public information efforts of organizations and individuals that provide earthquake information and services. It takes all of us to help keep communities healthy during flu season. Through education and planning, you can help protect your community from the seasonal flu. A community based training program dedicated to a neighbor-helping-neighbor approach. NWS serves as the U.S. official voice for issuing warnings during life-threatening weather situations. Protecting lives and property by effectively preparing for, preventing, responding to, and recovering from all threats, crimes, hazards, and emergencies. Developing an effective network to build collaboration and interaction among and within sectors to prepare and respond to pandemic and other large scale emergencies within the Greater San Francisco Bay Area. Our City& Ready For Anything. ResilientSF advances San Francisco's overall resilience by providing a framework, and road map, that coordinates plans, programs, resources and relationships that increase the capacity of individuals, organizations and communities to collectively solve problems and capture opportunities. The San Francisco Department of Emergency Management (DEM) manages disaster preparation, mitigation, and response; 9-1-1 dispatch; and homeland security grant distribution for the City and County of San Francisco. During an emergency, activates and manages the Emergency Operations Center (EOC), coordinates public information at the Joint Information Center (JIC), manages resource allocation and mutual aid, and liaisons with federal, state, regional, local, and private sector partners. and get checklists to help you get ready at home, at work, and in your community. ShakeOut - Get Ready to ShakeOut! California is considered at higher risk of earthquake hazards compared to the rest of the country. The ShakeOut has been created to help people and organizations get better prepared for major earthquakes, and practice how to be protected when they happen. Totally Unprepared is what happens when you put forward-thinking state agencies, earthquake geeks, social media nerds, a web analytics genius, a professional filmmaker, a hot firefighter or two, and a bunch of unsuspecting Californians in a blender and hit frappe. United Way of the Bay Area is harnessing creativity, expertise, and philanthropy to cut poverty. Use the Red Cross mobile apps to get expert first aid tips, prepare for disasters, volunteer, find shelter, teach your child to swim, and take care of your pet in an emergency. Instant safety, security, and peace of mind. Take care of everything from getting back your lost stuff to tracking your family. The City of San Francisco's Department of Emergency Management presents: SF Heroes. Earn points and gain Super Power Badges as you successfully complete tasks in the real world. Empower yourself to be a real-life hero in your community by learning how to prepare and protect yourself and your family in the event of an emergency.